“What is a church?” Now that seems like a easy question, the sort of question one might answer in an simple sentence or two. “A church is a building in which Christians meet for worship,” is one obvious possibility. “A church is a group of Christians who gather for religious purposes” is another. A critic might says, “A church is a club for insiders and hypocrites.” These quick answers don’t take us very far if we want to understand truly what a church ought to be. You’ll notice that I moved from the descriptive – what a church is – to the prescriptive – what a church ought to be. This wasn’t accidental on my part. In this series on the church, I’m not so much interested in what churches actually are, or in what people think churches are, as I am in what churches should be. When I ask “What is a church?” I’m wondering about the ideal rather than actual. My subtitle reveals the perspective from which I intend to address this question. I plan to discuss the nature of the church from a biblical perspective. That’s the sort of thing that evangelical Protestants like me tend to do, so I expect this comes as no surprise. I believe that Bible is God’s inspired Word, and therefore is to be our chief guide both for faith and life. In my opinion, nothing in this world tells us more authoritatively what the church ought to be than Christian Scripture. Roman Catholic and Eastern Orthodox believers would agree with me up to a point. They affirm the authority of Scripture as God’s Word. But they add the parallel authority of tradition, especially as embodied in the creeds and historic teachings of the church, and in the bishops who guard and pass on this tradition. I believe that Christian tradition ought to be taken very seriously. We Christians have much to learn from our brothers and sisters who have gone before us and who have sought to understand and to be the church. But, ultimately, I’m convinced we should weigh their convictions and practices in light of biblical teaching. For me, as for millions of Protestants across the globe, Scripture trumps church tradition though without denying the value of tradition. I also think it’s important to pay close attention to how Christians throughout the world interpret Scripture when it comes to the nature of the church. We all tend to read the Bible in light of our own cultures. We all project our meanings and values into the text. Careful interpretation of Scripture can help us see what is really there and not be tricked into thinking our projections are God’s revealed Word. But even then we can’t escape completely from our own worldviews and biases. Listening to what Christians from other cultures hear the Bible saying (and not saying) can help us interpret Scripture more accurately. But, even then, I believe Scripture stands authoritatively above the experience of all Christians. It’s always possible to say, “I see how you understand this text, but I believe your reading isn’t quite right.” Of course my reading might also fall short. 1. Though I take seriously both Christian tradition and the experience of contemporary Christians throughout the world, I believe Scripture has the final word when it comes to matters of faith and practice, including the question of what a church should be. Therefore, the best way to discover what a church should be is by a careful study of Scripture. 2. One way we can get to the true meaning of the biblical text is by reading it in light of its own cultural setting. If we want to understand the writings of the Apostle Paul, for example, we would do well to see them in light of his Greco-Roman-Jewish world. Doing this will help us avoid projecting our meanings and biases into the text. 3. At the same time, my purpose in this study isn’t just to interpret the Bible accurately, but also to see how biblical truth might take shape in our cultural setting (or settings) today. I confess that I cannot escape from my culture as I seek to interpret Scripture. And, I admit that my ultimate point is for churches to be in today’s world more of what God intends. Note: If you’re looking for a more theologically-oriented approach to the church than I will offer here, but one that is suitable for well-educated lay readers, I highly recommend It Takes a Church to Raise a Christian: How the Community of God Transforms Lives, by Tod Bolsinger. This award-winning book explains the nature of the church in light of the triune character of God, with lots of compelling illustrations and practical implications. Before we launch our investigation into biblical texts that reveal the nature of the church, I want to explain why I’m doing this series at this time. I’ll take this on in my next post in this series. Why Write This Series on “What is a Church?”? 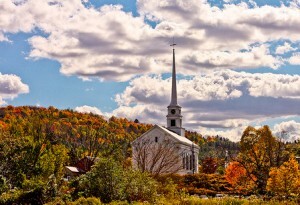 This is the second post in a series I’m calling: What is a Church? Biblical Basics for Christian Community. Yesterday, I explained that I’m planning to answer this question from a biblical point of view, though without denying the value of church tradition and Christian experience. I believe that, in the end, however, Scripture is the most authoritative guide for matters of faith and practice, including questions of ecclesiology (the study of the church). One additional point of clarification might be helpful here. Notice that I’m asking “What is a church?” rather than “What is the church?” I’m more concerned in this series about the nature of a particular Christian community than the whole configuration of Christians throughout the world and/or throughout the cosmos and/or throughout history. Of course these issues of local church/global church are interrelated. But my primary focus is on an individual Christian community, a church, if you will, rather than the church (or the Church). The sanctuary of Irvine Presbyterian Church, where I served as Senior Pastor for sixteen years. I’m taking on this series at this time for a variety of reasons. In part, it is an outgrowth of my ministry as Senior Pastor of Irvine Presbyterian Church, where I served from 1991 through 2007. During my tenure there, I found that folks often have differing visions of what a church should be, and that these differences can be either enriching of church life or debilitating, or both. If, for example, people joined Irvine Pres with a particular image of what a church should be, but it turned out that we were not what they had imagined, then it’s likely they would become disillusioned and start looking for another church that offered what they wanted. Nobody won when this happened. If, on the other hand, members of my church had a clear, common vision of what a church should be, then their experience would be more positive. Moreover, if our leaders shared this vision together, then our church would be healthy and growing in the right direction. Since leaving Irvine Pres in 2007, I’ve been serving in a pastoral role with Foundations for Laity Renewal, the parent organization of Laity Lodge. For over half a century, this organization has been committed to the renewal of the Church as it takes shape in individual churches. Thus, in my role as Theologian-in-Residence, I’ve done lots of thinking about the church and what helps it to be healthy. I’ve also found myself in dozens of conversations with pastors and lay leaders across the denominational spectrum, and I’ve had the chance to preach in Presbyterian, Baptist, Methodist, Lutheran, and Congregational churches. So my perspective has broadened in the last four years. As I write this series, there are lots of competing visions of the church in the marketplace of Christian theology and practice. Rick Warren’s The Purpose-Driven Church has had a major impact on Christian thinking about the church, not to mention the practice of individual churches. This book has helped thousands of churches clarify their mission and focus more intentionally upon it. Younger Christians (and a few not so younger ones) tend to be influenced more by an amorphous configuration of ideas and practices known as “the emergent church” or “emerging movement” or something like this (see, for example, The Emerging Church by Dan Kimball). Many in this movement want to do church in a whole new way. Yet, often, their experimentations are untethered to Scripture or even to a thoughtful ecclesiology. Thus, they may fall prey to replicating the mistakes of the past, or to excessive conformity to culture, or even to heresy. Yet, we who are older and more comfortable with the established church should not dismiss out of hand the efforts of the emergent folk. At least they are trying to deal with a huge problem for churches, namely, the impact of our increasingly secular culture and the resultant tendency of vast numbers of younger Christians to stop being involved in the church. For a troubling look at this reality, see David Kinnaman’s new book, You Lost Me. Of course, besides the Purpose-Driven and emergent models of church, there are dozens of other visions of the church floating around in the Christian atmosphere, ranging from home-based Pentecostal communities to more traditional churches that emphasize Reformed theology and the regular administration of the sacraments. Moreover, many evangelical Christians continue to be drawn to more liturgical churches of the Eastern Orthodox and Roman Catholic variety. Talk about a wide range of perspectives on the church! Then, you can throw into the mix the crises in which many of the well-established American denominations find themselves, including my own, the Presbyterian Church USA. Though our potentially-schismatic squabbles don’t have to do primarily with the nature of the local church, they have touched upon this issue, especially with respect to who actually owns the property of a particular church. Many Presbyterians, Episcopalians, Lutherans, and others have been asking what it means for a local church to be connected to a larger body of believers. Is this essential? Or optional? Should such connections ever be broken? And if so, when? Though I don’t intend to address these questions much in this series, they do loom over this investigation to some extent. Then there is the impact of the Internet on individual churches. Some Christians find that their primary interaction with other Christians comes in the form of an online church. They believe this is an adequate experience of church. Many other churches see the Internet, especially the social media dimensions of the Internet, as crucial for the church, but they’re not quite sure what to make of it. I will not be focusing here on this issue, but I do believe that we will be unable to use the Internet wisely as churches unless we have a solid, right biblical ecclesiology. As I begin this series, I’m particularly eager to help well-meaning Christians overcome some of the confusion they feel about what the church should be. Even in one particular church, even among leaders who share a common heart for Christ and a common commitment to Scripture, you’ll find a wide range of visions of a church. Some of these visions are derived from Scripture and to that extent are truthful. Others come from a wide variety of other sources. Some of these are helpful; many are not. In my next post, I want to consider where people get their ideas of what a church should be. People today have a wide variety of ideas about what a church should be. If you ask a dozen people you’d probably get a dozen different answers. One of my favorite answers to the “What is a church?” question came during a children’s sermon preached by a young seminarian. This story was related to me by someone who was in the congregation that fateful day. For those of you unfamiliar with this genre, a children’s sermon comes in a worship service when the folks twelve and under are brought forward for a sermonette by the pastor or some other church leader. Often the sermon begins with a question like, “What is God?” The preacher gets a bunch of funny – and incorrect – answers, and then offers the right answer, usually with a visual aid. At any rate, a young man was doing his seminary internship at a church. As the low man on the totem pole, he got tabbed for the children’s sermon and decided to talk about what the church really is. He gathered the children together in the front, and began with his question: “So, boys and girls, what is a church?” He fully expected that the kids would say a church is a building and a place to go on Sundays and so forth. He’d get to wrap up with the correct answer, that the church is not the building but the people. As soon as the seminarian uttered his question, one of the boys shot his hand into the air. “The gathered assembly of believers in Jesus,” was the boy’s answer. Most people don’t get their ideas of church from their seminary professor fathers, however. Rather, then get them from a wide variety of less sophisticated sources. Let me suggest a few obvious ones. 1. People get their ideas of church from their past experience of church. Indeed, this is surely true for people who have spent some time in church. These days, more and more people come to church with no religious background whatsoever. But most folks still have at least some prior history of church, even if it’s limited to weddings and funerals. As a pastor, I’ve found that people usually have both positive and negative experiences from which to draw. They want a church to be like what they’ve experienced in some ways, but not like other aspects of previous churches where they’ve been involved. People tend to have diverse feelings about their past church experiences. Some come with negative memories. Others look back through the rose-tinted glasses of nostalgia. For example, I’ve known people to complain about some innovation in worship and talk about how wonderful their church was growing up. When I ask if their church helped them to know Christ, to grow as his disciple, or to have a desire to worship God, they’ll say something like, “No, but that’s not the point.” Looking back, they love what they remember about worship in their childhood church, even though it didn’t help them know God better. 2. People get their ideas of church from pop culture. Even folks who’ve never stepped into a church might have seen the television show 7th Heaven (about a minister and his family) or The Simpsons, which frequently portrays The First Church of Springfield with its lovingly hypocritical pastor, the Rev. Timothy Lovejoy. 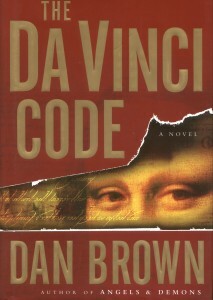 Countless millions of people have seen the church through the lens of The Da Vinci Code, with its deluded believers and diabolical bishops. On a happier note, millions of others have read about the exploits of Father Tim, the beloved, Episcopal priest in Jan Karon’s Mitford Series. Here, there are no sinister plots in church, only a bunch of ordinary, small-town folk sharing life together in a traditional, small-town church. One of my favorite series of novels, The Starbridge Series by Susan Howatch, explores the psychological, theological, and spiritual struggles of religious leaders in the Anglican church. Of course there are dozens of other images of the church in pop culture. These often shape the expectations of Christians and non-Christians alike. Unfortunately, it seems that often these images are negative, with pastors and church members pictured as judgmental hypocrites or unthinking extremists. Churches and church leaders can be pretty messed up, I’ll admit, but there are some good ones out there too. So, pop culture may not be the most reliable source of ideas of church, even though it is influential. Tomorrow, I’ll consider two other common sources of ideas about church. 3. People get their ideas of church from the news. Much of the time, what people get from the news isn’t all that positive. The media are generally not inclined to report on the good things that churches do, but church scandals tend to make headlines because they draw viewers and sell advertising. There are exceptions to this rule, however. For the past four years, I have been reading the San Antonio Express-News, the third largest paper in Texas in terms of circulation. The Express-News is owned by the Hearst Corporation. Though the paper reports on church problems, I’d estimate that 75% of its church-related stories focus on positive aspects of church life and mission. 4. People get their ideas of what a church should be from a projection of their personal needs and preferences. I’ve seen this sort of thing happen time and again. People have a need and figure the church is the sort of place that should meet their need. Sometimes it’s the desire to expand ethics education. Sometimes it’s the need for friendship, or financial assistance, or political activism, or, well, you name it. Folks take their needs and project them onto the church. To be sure, a church does meet many needs. Most importantly, a church should offer to people a way to fulfill their need for God. Closely related to this, church can be a place where people meet their need for deep, committed relationship with others. But this does not mean the church should meet whatever needs people might happen to feel. In my next post I’ll address one more source from which people get their ideas of what a church should be. This one, I believe, is often the most influential. Today I want to explore one other source, a source that has a powerful influence on the way people think about the church. 5. People get their ideas of church from analogous institutions. People often expect the church to be like some similar organization or event. For example, some people expect a church to be like a concert. When you go to a concert, you file into an auditorium. You sit in rows and watch something happening on the stage up front. If the concert is any good, you feel lots of positive emotions. At times you might even get into the act by standing, clapping, or even singing along. You leave a good concert feeling uplifted and satisfied by the performance. Church, for many people, is just like this, only better, because you don’t need a ticket, and don’t even have to pay anything if you don’t want to. Others think of church like a school. They come for religious education. When I lived in Irvine, dozens of young parents start attending our church each year because they wanted their children to receive moral training. And we did provide this sort of thing. Children gathered in age-grouped classes. They had curriculum and teachers. They did learn, or at least that was our hope. We also had lots of classes for adults. And we did hope to educate people. In many ways, we were like a school. For others, a church is like a club, perhaps a social club or a service club. We have regular meetings. We have members and a process for joining. Members can become leaders in the church. We do lots of different things together, including service projects and social gatherings. At church, as in a club, we make friends and find a center for our socializing. Many people today see the church as some kind of store. Small churches are like neighborhood mini-marts; large churches are like department stores. Both churches and stores “sell” products. Both have professional staffs. Both “market” their wares in the community, hoping to attract interested “consumers.” Larger churches, like larger stores, offer a wide array of “products.” Smaller churches, like small stores, offer more personal service but fewer “products.” If the church you attend provides what you’re wanting to consume, you continue to go there. If that church stops meeting your needs, you think nothing of finding a better church, just as you might switch markets or clothing stores. It’s also common for people to see the church as something like a hospital. When you’re physically sick, you go to a hospital to get well. Similarly, churches promise to help you overcome your spiritual ailments. Both hospitals and churches have professional experts to help you heal (doctors, pastors). Both hospitals and churches offer specialized treatments for particular ailments (in churches: singles groups, AA groups, etc.). Both hospitals and churches are staffed by people who care, or at least that’s the way it should be. 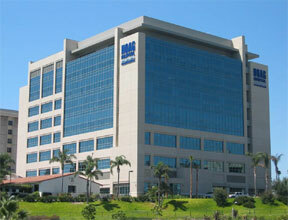 Many churches and hospitals even share similar names: St. Luke’s Hospital/Church, Hoag Memorial Hospital Presbyterian, etc. • A church is like a concert, but it’s better to see a worship service as a concert in which God is the audience and the worshipers are they performers, turning the concert imagery upside down. If people come to a worship service thinking it will be like a concert, then they might very well miss the main point of the service: to offer praise to God, who is the audience of our worship. • A church is like a school, but a church offers much more than religious and moral education. It seeks to transform people’s hearts and lives, not just to educate their minds. And it seeks for join people together in life-changing community. People who view church only as a school will miss much of what it has to offer. • A church is like a club, but unlike most clubs, membership isn’t a privilege, but a gift, and non-members are welcome to participate in virtually every aspect of “club” life. A church, unlike a club, exists not just for its members, but especially for its non-members. Those who think of their church like a club tend to exclude others and to think that their church exists primarily to meet their own needs. • A church is like a store, but it ought to do far more than offer “products” for consumption. A church will thrive only if its members are committed to the church in a way far beyond consumer loyalty. So if you think your church is like a store, you’ll never get truly involved in the life-giving, world-changing fellowship of the church. • A church is like a hospital in that it offers healing to those who are spiritually sick, just like Jesus did. But a church is not like a hospital because it seeks, not only to get “patients” well, but also to enlist them on the caring team. When you go to a hospital, you’re not expected to become a doctor or a nurse. When you got to a church, you should join the care-giving team as well as receive care. Ironically, biblical teaching on the church is rather like what I’ve just laid out. Scripture uses analogies to reveal the essence of the church. Each analogy has certain strengths; each analogy also has certain limitations. So, for example, we’ll soon see that the church is meant to be like a human body. But it is not meant to grow old and die in three or four generations. So, a church is both like a body and unlike a body. In the posts that will follow in this series, I’ll try to unpack the biblical analogies for the church. Taken together, these will reveal the true nature of the church from God’s point of view. In my life, I’ve probably heard a hundred sermons or teachings on the church. I’ve probably given a hundred more of my own. In virtually every one of these talks the same point is made: “The church is not a building. It’s the people of God.” Of course, in common speech we refer to the place where Christians gather as a church. But this has nothing to do with biblical theology and runs the risk of fostering a profound and detrimental misunderstanding. At this point, you’re probably commending me for my grasp of the obvious, or perhaps thinking about skipping this blog post altogether. But now’s the time I take an unexpected turn. For I would argue that the use of “church” in our English New Testaments as a translation for ekklesia is problematic at best, and misleading at worst. Yes, that’s right. I’m saying that the word “church” should not appear 75 times in our Bibles, or 110 times including the plural. This, I fear, is a seriously misleading translation. Now you might really be thinking even more seriously about skipping this blog post, since I’m now arguing a minority position versus almost every English Bible translation and Greek-English dictionary. But before you dismiss me as hopelessly eccentric, please allow me to defend myself. One line of defense would be to point to the most recently published English translation of the New Testament, The Kingdom New Testament: A Contemporary Translation, by N.T. Wright. I have not had time to check every possible translation of ekklesia. But I was impressed to see that Wright does not use “church” in such verses as 1 Thessalonians 1:1. Usually this verse includes the phrase, “To the church of the Thessalonians in God the Father and the Lord Jesus Christ.” Wright prefers: “to the assembly of Thessalonians in God the father and the Lord Jesus, the Messiah” (1 Thes 1:1). Not “church,” but “assembly.” I think Wright is right on in this translation. This was not the case for ekklesia in first-century Greek parlance. If, for example, a Christian traveler showed up on the streets of Corinth in the first-century A.D. and asked for the location of the ekklesia, nobody outside of the tiny Christian community there would direct him to a religious gathering. Nobody would think he was asking about anything that had to do with the gods or with religious practices. An ekklesia wasn’t anything like a church. Greek had words for religious gatherings, words such as thiasos (cultic society) or synagoge (Jewish gathering). But ekkelsia wasn’t one of these words. Ironically, one might same the same thing for the use of the word ekklesia in the Greek translation of the Old Testament (the Septuagint, abbreviated as LXX). This word appears about 100 times in the LXX, almost always translating the Hebrew term qahal. Both words, ekklesia and qahal, have the basic meaning of “assembly” or “gathering.” They can be used to describe a gathering for religious purposes, but the words themselves don’t have religious connotations. They need something like “of the Lord” to make the religious setting clear. So, then, what is the New Testament understanding of ekklesia? If this word isn’t equivalent to “church,” what other English word or words might better render the sense of ekklesia? To these questions I’ll turn in my next post, though N.T. Wright has already dropped a big clue. In my last post, I argued something fairly commonplace: that the word “church,” understood theologically, does not refer to a building but to the congregation who uses it. This is not news, though it deserves to be repeated. Then, I argued something fairly unusual: that the English word “church” is a poor translation of the Greek word ekklesia, the word that is almost always rendered as “church” in English translations of the Bible. I explained that ekklesia in standard first-century Greek did not have a religious connotation, and therefore “church” smuggles in meaning that was not present in ekklesia. So, you might wonder, if “church” isn’t the best translation of ekklesia, what might be better? I’ll try to answer this question, first by looking at the ordinary first-century meaning of the Greek word ekklesia. Almost all New Testament uses of ekklesia are distinctive in comparison to secular Greek, since ekklesia is almost always used to denote a particular gathering, that is, of believers in Jesus. In Acts of the Apostles, however, ekklesia is used three times in a more or less ordinary secular sense, though perhaps ironically. 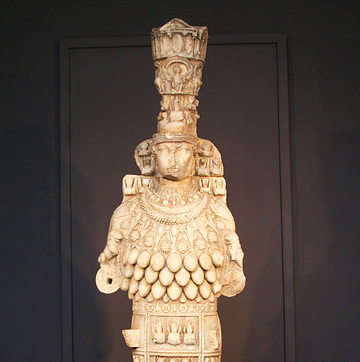 The top portion of a statue of Artemis of Ephesus. The context for this usage is Paul’s ministry in Ephesus (a city in what is now western Turkey). For two years, Paul preached the gospel there, with considerable success. Many residents of Ephesus put their faith in Jesus and rejected their pagan practices. This led to a sharp decrease in the sales of little silver trinkets of one of the most popular pagan gods, Artemis. Those who made their living by making and selling these souvenir idols became enraged, fearing the loss of their livelihood. So they stirred up their fellow Ephesians, who all rushed together to the theatre at the center of town, dragging a couple of Paul’s companions with them. Acts tells us that the assembly in the theatre was in great confusion. The Greek word translated as “assembly” is ekklesia (Acts 19:32). When one man tried to address the gathering, he was shouted down because the pagan Ephesians were biased against him, owing to his being Jewish. Finally, one of the civic leaders of Ephesus managed to quiet the people down. He told them not to worry about the worship of Artemis and to follow appropriate legal actions if they had been wronged by Paul and his retinue. The leader concluded by saying, “If there is anything further you want to know, it must be settled in the regular assembly [ennomoi ekklesiai, literally, the lawful ekklesia or assembly]” (19:39). Then, Acts tells us, the official “dismissed the assembly [ekklesian]” (19:40). From this story in Acts we can learn several things about the word ekklesia. Most simply, it meant “assembly” or “gathering.” It referred to some sort of meeting of people who had come together for a particular purpose. In Greek society, the ekklesia was the assembly of full citizens in a particular city. (Most residents were not full citizens at that time.) Thus, the ekklesia was rather like the city council in a modern American city in terms of its authority. Ekklesia was a common Greek word for a gathering of people. Yet, it came to have a special meaning in reference to the assembly of the voting citizens of a city. In this sense it was the “regular assembly” referred to in Acts 19:39. But, as we saw in Acts 19:32 and 40, ekklesia could also be used to describe an unplanned and unruly crowd of people (perhaps ironically). As I mentioned in my last post, ekklesia was not used specifically for religious convocations, not did it have religious overtones. The first-century Greek speaker would not thought of the gods or of a religious gathering when hearing the word ekklesia. Thus, if I were a Bible translator, I’d opt for “assembly” or “gathering” rather than church for most New Testament instances of ekklesia. I agree with N.T. Wright’s recent translation of ekklesia as “assembly,” as I mentioned in my last post. What gives the Christian ekklesia its distinctiveness is not the fact that it is an ekklesia, but the fact that it is an ekklesia in God. More on this later. All of this raises some fascinating questions about the meaning of ekklesia in early Christianity, and why the early Christians chose this particular word to describe their meetings. I’ll try to answer these questions in my next post. Presumably, of course, he had taught the Thessalonian Christians to think of themselves as an ekklesia, so they would know what he was referring to when he used this word. Given what we’ve seen earlier about the meaning of ekklesia, it’s quite likely that Paul was referring to the actual gathering of Christians in Thessalonica, not some ideal assembly. 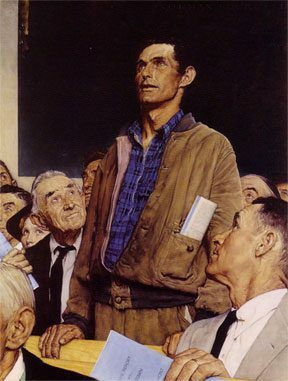 He envisioned that his letter would be read in this gathering and he was addressing the people who were in fact present. There’s no evidence that he was thinking, as we might think, of all the members of the Thessalonian church, whether they were present for the reading or not. Paul was addressing a real assembly, an actual gathering of people. These were the ekklesia of the Thessalonians in God and Christ. Support for this understanding of church comes also from Paul’s letter to Galatians. He addresses this letter to: “The churches [ekklesiais] of Galatia” (1:2). The use of the plural is telling here. When Paul writes a letter to the Christians in the region of Galatia (in the center of modern Turkey), he does not think of them as some sort of spiritual group that could be called a single ekklesia that never gathered together in the same place. Rather, they were a bunch of ekklesiai, “assemblies” in the plural. In some of Paul’s later writings, notably Colossians and Ephesians, he expands the sense of ekklesia beyond this basic, literal sense. As a matter of fact, I even think it’s possible to speak of the “scattered church.” I’ll discuss these matters later. For now, however, I want to make the simple point that the essential meaning of ekklesia includes the notion of an actual gathering of real people. Paul wouldn’t know what you meant if you said, “The Thessalonian ekklesia didn’t meet today.” From his point of view, there would still have been a few dozen Christians in Thessalonica, and they would still have had many ties together in Christ and in the Spirit, but they wouldn’t have been an ekklesia if they didn’t actually meet. It may seem like I’m making an academic and linguistic point here that is of interest to scholars but otherwise of little practical value. On the contrary, I think what I’ve just said has profound implications for our actual understanding and practice of church today. I’ll explain this in my next post in this series. I realize that this might sound rather trivial, the sort of thing that advances academic careers while boring ordinary people to death. But there are, I believe, important implications of the meaning of ekklesia for our understanding of what a church is. 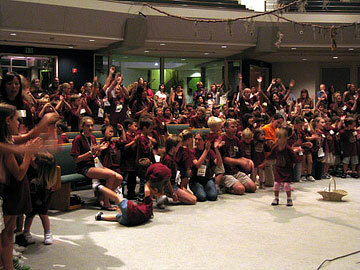 Some of the children of Irvine Presbyterian Church worshiping during Vacation Bible School. Now that’s what I call an ekklesia! Once we get beyond the “church is a building” mistake, we tend to think of a church as “all of the members of a particular Christian institution, whether they are present in the gathering or not.” When I was Senior Pastor of Irvine Presbyterian Church, if you were to ask me, “How big is Irvine Presbyterian Church?” I’d have said, “Oh, we have about 750 members.” I do not mean by this that we ever had all 750 in the same place at the same time. In fact, that never happened because, among other things, we didn’t have a room large enough for this number of people. In common speech, Irvine Presbyterian Church was composed of those who decided to consider this particular group of people their religious home, whether they showed up very much or not. This understanding of church has some benefits, to be sure. It means that you’re part of the church if you’re sick on a Sunday and can’t show up for worship. This is comforting, to be sure. But there is a downside to thinking of a church as a collection of people who may or may not ever actually be together. This downside is illustrated in a conversation I’ve had with people time and again throughout my pastoral life. For example, a woman was talking about her church, so I asked, “Oh, are you a member of _______ Presbyterian Church.” “Yes,” she answered, “I’m a member there. But I don’t attend very often.” If the church has nothing to do with actual gatherings, then this is fine. But if the essence of the church is related to actual assemblies of actual people, then the one who rarely shows up is hardly a member of the church. I’m sure you’ve heard this sort of thing before. Maybe you’ve said it yourself. You can be a member of a church in good standing and not be physically present in the regular gatherings very often. In fact, these days, you can be a member of a church while attending another church most of the time. From a New Testament point of view, however, this is peculiar, indeed. One was part of the ekklesia in Thessalonica if one was part of the real gathering because, indeed, ekklesia meant “gathering.” To say, “I’m a part of a church but I don’t attend very often” would be rather like if you invited me to a party at your house on Sunday evening, “I’m having a little gathering of friends on Sunday night. Can you come?” and I answered, “Sure, I’ll be a part of your gathering, but I won’t be able to attend.” You’d be confused by my answer, because being a part of a gathering means being physically present. I’m belaboring this point because one of the major problems in our churches today is that many of our members don’t actually participate very much. I saw a survey not long ago that found average church attendance in America to be 30-40% of membership, and this includes non-member visitors. It’s likely, therefore, that only about one-third of people who associate themselves with a particular church actually associate in reality with that church on a regular basis. To put it negatively in the vernacular, about two-thirds of church members don’t regularly go to church. But if the ekklesia is meant to be the actual gathering of people, not some ethereal club, then something is terribly wrong when the majority of so-called church members aren’t regularly present with the church. Please understand, I’m not necessarily blaming church members for this problem, though they surely contribute to it. Churches and church leaders have much to do with the problem of inactive members. Among other things, we have perpetuated that notion that church is about joining something where literal attendance isn’t assumed. Moreover, we have often made the content of our assemblies so boring and irrelevant that I can’t blame folks for attending irregularly. All pastors need to ask themselves: Would I show up on Sunday morning at my church if I didn’t have to? To sum up: When is a church not a church? If we take seriously the New Testament sense of ekklesia, then our answer is: When the church is not gathered together. To translate a bit more literally, The assembly is not the assembly when it isn’t assembled. Now, I certainly believe there’s a sense in which we can be the church when we’re scattered in the world, and I’ll have more to say about this later. But, for now, it’s important to note that there’s something extremely important, and, indeed, essential about the actual gathering of Christians. Though there may be a derivative sense in which the church can be scattered, the regular assembly of believers is absolutely crucial to the health, if not the essence of a church. Let me begin with a brief review. In my last few posts in this series I’ve been exploring the meaning of the Greek word ekklesia, which is ordinarily translated as “church.” This translation, however, is not necessarily the best because the English word “church” always has religious connotations, whereas ekklesia was a secular word that meant “assembly” or “gathering.” When it was used in the phrase “ekklesia of God” it referred to a Christian assembly, but the religious sense came from “of God,” not from ekklesia. Moreover, in the common Greek of the New Testament era, ekklesia denoted one particular kind of assembly, the gathering of citizens in a city to do civic business. In this sense, ekklesia had a meaning rather like that of the classic New England town meeting. My last post focused on the implications of the broadest sense of ekklesia. If an ekklesia is an actual meeting of people, then a “church” exists when Christians gather together. The physical meeting of believers is essential to a right understanding of church. This stands as a critique, I suggested, of the American tendency to downplay the importance of church involvement. In our speech and practice, one can be a member of a church without showing up for the gatherings. This, however, is out of step with the basic notion of ekklesia. With this review in mind, I want to ponder a bit further some implications of ekklesia for our understanding of the nature of a church. I want to begin to work on the implications of the more specific meaning of ekklesia: the gathering of citizens of a particular city. As we have seen previously, that is one of the meanings of ekklesia that would have been familiar to Christians in cities throughout the Roman Empire. Of course we can’t know for sure that the citizens of Thessalonica reacted this way when they heard about the “ekklesia of the Thessalonians in God,” but it’s likely they were at least confused if not a bit miffed. Surely Paul and the other early Christian church planters knew what they were getting into by calling their gatherings ekklesiai (plural of ekklesia). No doubt they realized that referring to the Christian meetings as thiasoi (religious clubs) or synagogai (assemblies, synagogues) would be less troublesome. Yet they chose ekklesiai in spite of the potential for that name to cause trouble for the believers in a city that already had its own ekklesia. It would seem that the early Christian use of ekklesia was indeed meant to be a bit subversive, but not in the ordinary manner. The first followers of Jesus were not intending to overthrow the established ekklesia of their cities. They were not plotting political rebellion. Yet, the Christians were setting up an alternative society which, as it grew, would indeed come to upset the apple cart of civic life throughout the Roman Empire. The Christian ekklesia was not some little religious club off in a corner or some innocuous gathering fit nicely into Greco-Roman society. Rather, it was a thumbnail sketch of the kingdom of God. It was a foretaste of the new creation yet to come. And, in this sense, it was an alternative community, even an unusually subversive one. Tomorrow I’ll explain in more detail how this looked in the first century and how it might look in ours. In yesterday’s post, I explained how the early Christian use of the work ekklesia for their gathering suggested that the church was an alternative, even a subversive community. By subversive, I do not mean that Christians were plotting to overthrow the local ekklesia (governing body of the city) by political or military means. Rather, the early Christian use of ekklesia did, in some sense, undermine the social order of the Greco-Roman city, with its ekklesiai (plural of ekklesia, town meeting-like gatherings to do city business). The Christian ekklesia was meant to be an alternative society, a society of a radically different order with radically different values. It was a thumbnail sketch of the kingdom of God. So, for example, in the ekklesia of God, Jews and Gentiles, so often separated in Roman society, shared life together as brothers and sisters. Slaves could also be full participants in the Christian gatherings, enjoying equality in Christ with non-slaves, even with their masters. Women could actively participate in the gatherings just as long as they didn’t engage in the scandalous behavior of the pagan cults. The theological truth that in Christ “there is no longer Jew or Greek, there is no longer slave or free, there is no longer male and female” was lived out in the Christian assemblies (Galatians 3:28). Thus, they were a kind of alternative society, one that implicitly rejected the domineering, separatistic, and elitist values of the Roman world. Could it be said that the church in America today is also an alternative society? Perhaps, in some places and at some times, but I fear these are the exceptions to the rule. The church in our culture tends to play a very different role than what was once envisioned by Paul and the earliest Christians. On the one hand, we often reflect the fallen values of our society rather than the holy values of God’s kingdom. For example, put a church in the middle of a materialistic culture and, odds are, the church will be materialistic too. On the other hand, we have often been satisfied to play a comfortable religious role in society, offering a spiritual narcotic to soothe jangled nerves rather than an alternative way of living under God’s rule. We don’t want to rock the social boat. We want to find our niche in society so that society will smile upon us. Of course there are some Christians, who, like the Amish, withdraw from society in order to live as God’s chosen people. But they hardly reflect the reality of what the Christian ekklesia ought to be in the world. Christians who are active in politics, whether on the left or right side of the political spectrum, may see themselves as the rightful heirs of the early Christian ekklesia. Indeed, their desire for God to make a difference in this world does reflect what we see in the New Testament understanding of church. But nowhere in Scripture do we get the idea that the role of the ekklesia is to directly influence (or replace) the civic ekklesia. Nowhere is it suggested that the Christian assembly should major in “speaking truth to power,” other than the truth of the Gospel of Jesus Christ. Rather, the power of the ekklesia to change society comes from the authenticity of its corporate life, which is a manifestation of the presence and power of the Holy Spirit. In the New Testament, the ekklesia offers, not political advice to the members of the civic ekklesia, but, instead, a whole new way of living, one that reflects the kingdom of God rather than the empire of Caesar. Let me apply what I’m saying to my own denomination. If you’re not part of the PC(USA), I expect you’ll find things here that are relevant to your denomination and/or local church. I come from a denomination that has often seen itself as a counselor to the federal government and other leaders. We pass motions and write position papers, recommending to our leaders what courses of action they should take on a variety of issues. There is a sad irony in all of this, because, on the one hand, I don’t think many of our national leaders care one bit about what we recommend. On the other hand, our efforts to “speak truth to power” often end up dividing us and impoverishing our own fellowship. The very thing that should be making a difference in society – our life together as an alternative community – is hampered by our misdirected efforts to make a difference in society through the ministry of pronouncements. How I wish we’d stop trying to recommend to our government how it should act and start, instead, trying harder to get our own act together. What would this mean, in practice, for my denomination? • It means we would care much less about the proceedings of our national assemblies (ekklesiai) and pay much more attention to the regular, tangible, essential gatherings of our local ekklesiai. • It means that our denominational bodies would put much more energy into nurturing healthy ekklesiai than we do today. We’d see our denominational purpose primarily in terms of planting and nurturing churches through the Gospel. • It means we would be open to new denominational structures that support our mission, rather than holding on to the structures of the past that guarantee our power but weaken our common life and mission. • It means that we would strive harder to be an alternative society through our ekklesiai, one that truly reflects the gospel of Jesus Christ, one that shines as a light into our dark world. • It means that we would see our local gatherings as essential, not only to our congregational life, but also to the health of our cities. • It means we would care more about doing God’s justice, and less about talking about justice in ways that divide and weaken our churches, thus enfeebling our efforts to do justice. I’m speaking about my denomination here as an example. What I have just said about the PC(USA) would be relevant to other denominations, and even to non-denominational bodies. I find it fascinating that many so-called independent and non-denominational churches today are becoming “multi-site” churches. The distance between “multi-site” and “denomination” is really very small. Before I finish my discussion of the meaning of the word ekklesia – usually translated as “church” – in the New Testament, I need to say something about the use of ekklesia in Paul’s letters to the Colossians and the Ephesians. I’m a now and then collector of old hymnals. I was glancing through my collection recently to see if I could find any interesting hymns about the church. I did indeed find a curious selection in The Sunday-School Service and Tune Book. It’s called “Beautiful Church,” by Rev. E. L. Drown. I find his vision of the church – and here we’re talking largely in terms of an actual gathering – quite fascinating. See the appendix to today’s post. Curiously, neither of these letters are addressed to an ekklesia or to a group of ekklesiai as is the case in Paul’s letters to Corinth (both letters), Galatia, and Thessalonica (both letters). Colossians is addressed to “the saints and faithful brothers and sisters in Christ in Colossae” (Col 1:2), while Ephesians was sent to “the saints who are in Ephesus and are faithful in Christ Jesus” (Eph 1:1). The greetings at the end of Colossians reflect the sort of tangible, actual-gathering quality of ekklesia that we have seen before in Paul. He greets “Nympha and the ekklesia in her house” as well as the “ekklesia of the Laodicieans” (4:15-16). Then, in Ephesians 5, ekklesia shows up six times. Christ is “the head of the church, the body of which he is the Savior” (5:23). The church “is subject to Christ” (5:24). Christ “loved the church and gave himself up for her” (5:25). Christ seeks “to present the church to himself in splendor” (5:27). 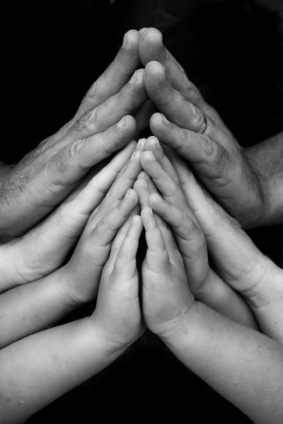 He nourishes and tenderly cares” for the church (5:29). Finally, like the unity between husband and wife, so it is with Christ and the church, something Paul refers to as “a great mystery” (5:32). The meaning of ekklesia in Colossians and Ephesians has clearly moved far beyond the literal gathering of Christians in some location. Now the ekklesia is the body of which Christ is the head. It appears to be some cosmic reality that transcends ordinary space and time, and that encompasses far more than a single gathering of believers. Paul seems to be envisioning some sort of “gathering,” now used metaphorically rather than literally, of all Christians on earth and in heaven. This ekklesia has permanence in time like an actual body. An ekklesia in the regular sense may come and go, but an ekklesia as a body remains intact over time. The relationship of the church/body in Colossians and Ephesians and the local church is not spelled out in detail. Though Paul uses ekklesia in a new and greatly expanded sense, he can still refer, as I mentioned earlier, to the ekklesia in Nympha’s house (or that meets at her house, Col 4:15) and to the ekklesia of the Laodiceans (4:16). His specific instruction that his letter be read “in the ekklesia of the Laodiceans” suggests that Paul can still use ekklesia in the ordinary sense of the tangible gathering. Yet, at the same time, the ekklesia is also a much larger and more permanent reality. It is something that can be spoken of as a body, with Christ as the head. The use of ekklesia in Colossians and Ephesians offers a fitting segue to the next image I want to investigate in this series on the church, the image of the body. To this I will turn in my next post. Has built this beautiful Church for me. Thank God, this beautiful Church is ours! The Church that leads us home to God. With hearts of faith the Saviour see. Come to this Beautiful Church with me. 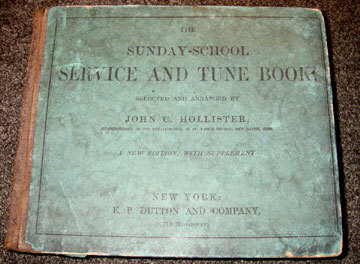 From The Sunday-School Service and Tune Book, ed. John C. Hollister (New York: E. P. Dutton & Co., 1863) p. 155. Recap: In this series, What is a Church?, I’m trying to discover what the Bible says about the local church. What is, or better yet, what should this odd collection of people we call a church be like? What is the nature of a Christian community, according to Scripture? So far I’ve examined in detail the meaning of the Greek word ekklesia, which is usually translated as “church” in our Bibles. In my last post, I noted that Paul’s letters to the Colossians and to the Ephesians talk about the church in terms of a body, with Christ as the head. This points to the next stop in our tour of New Testament images for church. But we won’t start with Colossians and Ephesians, since these are some of Paul’s later letters. (Yes, I’m aware that some scholars believe them to be written by one or more of Paul’s disciples, but I’m convinced that they are from Paul’s own hand.) Rather, we’ll start with 1 Corinthians, the oldest extant reference to the gathering of Christians as a body. Paul wrote 1 Corinthians sometime in the mid-50s A.D. Previously, he had ministered in Corinth, a city in southern Greece, perhaps for around a year and a half, leaving behind a collection of believers in Jesus. After Paul left town, these folks continued to meet together in a regular gathering (ekklesia), or perhaps in several gatherings (ekklesiai) located in various homes. Paul was writing to the Corinthians from Asia Minor (modern Turkey). While ministering there, he had received a visit from “Chloe’s people,” who were probably members of her household, perhaps relatives, servants, or slaves, though we can’t be quite sure. They brought bad news of divisions among the Corinthian Christians. This may not have been the first Paul had heard of this, because he had also received as visitors three men from Corinth (1 Cor 16:17). These people had, among other things, delivered to Paul a letter from the Corinthian Christians (1 Cor 7:1). The combination of reports and letter concerned Paul greatly, especially as they related the disunity among the Corinthian believers. So he decided to write the letter we know as 1 Corinthians. (In fact, however, it was at earliest the second of Paul’s letters to these believers; see 1 Cor 5:9). One of the main things Paul intends to do in 1 Corinthians is to help the immature Christians there understand who they are together. We would say: Paul wants them to know who they are as a church. Yet he doesn’t do this by drawing out the deeper implications of the word “church” (ekklesia). Rather, Paul uses the image of the human body as a way of explaining how the Corinthian Christians are related to each other, and therefore how they should in fact treat each other in their gatherings. Their likeness to a body makes clear the fact that they should be unified rather than divided. It also suggests how they can achieve unity in a practical way. Before I get to Paul’s teaching about the church as a body, however, I need to say a few things about Corinthian society, and why this may have led to divisions in the Corinthian ekklesia. I’ll do this in my next post in this series. In my last post I began to explain why the Apostle Paul wrote to the Christians in Corinth, and why he used the image of the human body to help them understand who they were as God’s people together. The core problem was that of division in the Corinthian ekklesia, with members treating each other in an unloving manner and failing to value their connectedness in Christ. The more you learn about Corinthian culture in the first century A.D., the less you are surprised by the problems occurring among the Christians there. 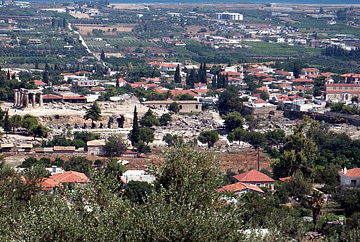 Corinth was located in southern Greece, in a prime location for travelers and merchants moving across the Mediterranean Sea. 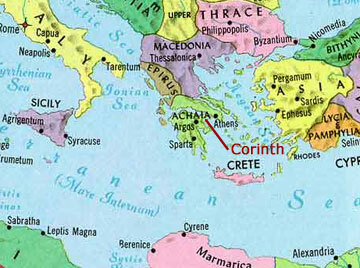 Thus Corinth was a hotbed of economic opportunity, unlike much of the rest of the Roman Empire. The city had lots of new money and all that often comes with it: pride, boasting, extravagance, prejudice, resentment, selfishness, sexual adventurism, etc. Given what I’ve said about the diversity and unsettled nature of Corinthian society, it shouldn’t be surprising to learn that the Christian gatherings weren’t without their challenges. After all, if you were to bring together people from different socio-economic brackets, religious backgrounds, and ethnicities, and put them in close fellowship with each other, and supply only minimal leadership, then you would surely find yourself with a mess. And that’s what Paul experienced with the Corinthians. Please understand that I’m not necessarily criticizing the Corinthian believers for this situation. After all, they were relatively immature Christians when Paul left their city to plant churches elsewhere. They didn’t have Bibles, since the New Testament wasn’t written yet, and they would have had at most very limited access to scrolls in the local Jewish synagogue. They didn’t have mature Christians to lead them (except perhaps for a few visiting missionaries, but these could be problematic). They didn’t have Christian books, tapes, CDs, DVDs, or websites. What they had was a memory of Paul’s teaching, some of which they misunderstood or found confusing, and the presence of the Holy Spirit. I’m not minimizing the value of the Holy Spirit, mind you. Indeed, there is no better resource for Christian community that the third person of the Trinity! But the problem is that Christians, especially immature ones, can easily get confused about the Spirit. They can attribute to the Spirit works of the flesh, or even of demons. They can claim for themselves spiritual inspiration when none is truly to be found. And this is exactly what happened at Corinth. In my next post in this series, I’ll say a bit more about the specifics of this Corinthian confusion about the Spirit, and how it relates both to their culture and to the divisions within the Corinthian ekklesia. Then we’ll be ready to dive into Paul’s teaching on the church of feet and ears.